Cranio Sacrale Behandlung bei Stress! Mavie Yoga = mavie = my life = Yoga. A simple way to introduce myself. I practice Ashtanga Yoga – my own practice changed a lot over the years. Since I teach I got even more understanding about this Universal Yoga system – from that I changed also my style of teaching over the years. I am a dedicated student of Asana Alignments and there are many books about how a proper Asana should look like. It is very usefull to know everything about the Asanas the Vinyasa System but beside of that there are much more a teacher has to know. I have to say that my main focus is on the Breath and how to bring the attention inwards. The breath brings you to the stillpoint – I think there is no other way. If you cannot focus on your breath you will not find the Essence of the Yoga Practice. A deep way to breath makes your mind calm, is your mind calm and silent your muscles can relax and a relaxation of your muscles and your nerve system has a positive effect of your whole body awareness. A proper breathing technique can release emotions and blocks from your body – everything that makes you stiff at the end and gives you a feeling of heaviness and stiffness. My teaching is influenced by my own Yoga practice, my knowledge about the Ashtanga Vinyasa System, the part the breath has in the Yoga practice and the holistic knowledge I got and still get through my Cranial Sacral Work with the ability to sense peoples energy body. „Adjusting people is never about to bring a body in a better or deeper position it is about giving the person a save feeling in an environment where the whole human system (body – mind) can release what comes up and is ready to leave. A soft touch from a person a teacher in a gently and warm way can heal parts of the body mind system very quickly“. For me the most important thing in my life as a Yoga practitioner is to have a daily practice, which can also be sometimes only sitting in silence and observing the breath, and to know to have a teacher who act exactly in that way I described. Such a person can guide you through your life and also through a led class J . The real challenge is to find such a teacher who fits. GREECE/CRETE/SOUGIA – YOGA makes the difference! those who actually do it. A week of retreat means I will be on the mat every day and do my asana practice. For many not easy to imagine, since you first of all want to be lazy on your holiday and want to spend time free of any obligations. If you do it nevertheless, then something new is created. The feeling that comes up after a practice is a different essence than what one already knows as well-being. Sometimes it is the pure joy of the movement or a whole new form of movement, sometimes you experience the feeling of letting go in a held asana, you experience strenght and getting stronger. 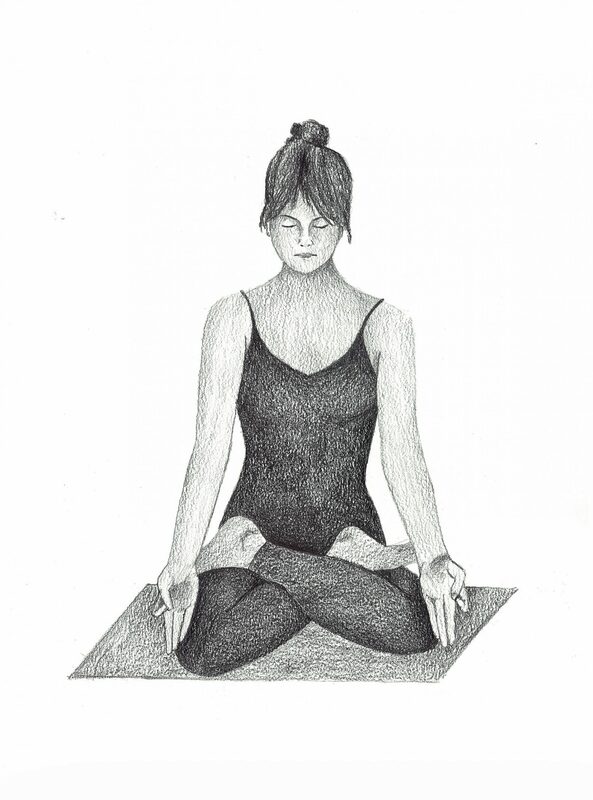 At the same time, the practice of yoga causes a sharpening of the senses. I see better what is and what is not. And these achievements accompany you through the day – through life. I would recommend at any time to everyone to start practicing Yoga now and feel the difference. Sougia is a great place to start. The Yoga Retreat in Sougia starts in a couple of days. Why I call it Retreat? The name Retreat is, because every day you get a lot of classes offered and all classes are about YOGA and the YOGA PATHWAY. You can join the full retreat on a weekly basis or you can be a kind of drop in student. It is up to you how much time you want to spent on that YOGA event in Sougia. From the last years I know that at such Retreat the fun factor is great and it is also expected and very welcomed by all of the participiants. Seriously, I would say that I like to have fun and a good portion of craziness is a „Must have“ attitude, provided it comes naturally. In my Yoga classes I am absolutely serious in that sense that everything I have learned from all of my teachers I try to pass on very carefully. I have a good eye for peoples body and I get already a lot of information about them only by watching them. In that way I am very serious and very concentrated on that what I am doing. But I also make sure that in my classes the fun factor is still there. I like to be joy- and playfull. Lightness is an important life value for me. To laugh out loudly is sometimes the better stretch for our whole life and body system than the ability to bend ourselves in all possible or impossible directions but with an serious petrified face. „When you come in my yoga class – I will be there! You will get a perfect led class. or a perfect Mysore Style Class. I teach you in all yoga poses of the primary and intermediate series. I pick you up exactly at that point where you actually in your own practice are and I would like to bring you in your yoga practice a step forward. I like to touch people at different levels. Find me at my place! MAVIE Yoga House Sougia – Drop in and do what you can – that is enough. I support you in your practise as much as I can. Sougia Time is coming closer. In two month I am again on my way to Sougia. This year will be a bit different than all the other years before. This year I have a small YOGA House with a big terrace where we can practice Yoga all day long. It is a perfect place on the top of a house which is in the middle of the small village. The Yoga place is quiet and peacefull, sun and wind protected and is surrounded with very good energy. From this terrace you can see the sea and the mountains. The most amazing thing will be to do the sun solutions in the direction where the sun is rising. I am so happy to have this place and I am glad to offer that space to people who wants to join the Asana practice and experience the Yoga feeling with me. If there are no workshops in the afternoon nevertheless the door will be open for Meditation. If you are experienced in Meditation come and sit in silence with me and other peopel at the Yoga Place and feel the special Energy which will be created by all of us. Come and see – come and feel! At a place like this good things will grow. The every day challenge of an Ashtangi! Following the path consequently – that is what I am doing. No matter whether I am alone or in company, how I feel, how the circumstances are I am surrounded with. What I have learned is that daily yoga practice is necessary for me to understand life and myself better. Sometimes life gives us additional but unexpected issues. This happened to me a week ago. It was very much interesting to observe all the intensive feelings which came up. When I am in pain I only want to escape from this torture at once. I was asking for help, I wanted that somebody stops this nightmare. The quicker I realized that I am the only one who can do healing work for myself and since I started, the better I felt. Not only because pain slowly was gone, I felt better, cause I realized that I was doing successful healing work for my body too. I am used to do healing work with other people as I am a practitioner in Cranio Sacrale treatments. Faith and trust in myself and in my abilities came back and at the same time I felt that my sensations have become much more sensitive than before . During this week I did not stop practicing. I did and I do what I can do and in a completely focused and deep connected way with my inner world and the sound of the breath. Only today I was a bit irritated by a little Gecko which wanted to share my mat with me. But tomorrow is another try and another day… and I guess it will be again a bit better than the day before. I think I got the lesson of this chapter and I can follow the path with full attention but not knowing what comes next. Years ago I found two fantastic places with special quality. A quality that can not be described, but you could feel it. In these places, I spend several weeks a year practicing yoga and teaching Ashtanga Yoga workshops. Over the years, more and more people have shared my enthusiasm and so I wanted to create a space that would provide yoga space for several months a year, or allow and encourage any kind of getting together. One place is located in Sougia. Sougia is a small town in the south-west of the island of Crete. The second place is in Africa, Kenya at Diani Beach. Both places are surrounded by fantastic energy. Especially Sougia has something special. In Kenya one feels the proximity to the equator; For me is the equator similar to the navel of Mother Earth. At that area you feel different; How different is difficult to describe. Anyone who has ever been to Africa will perhaps know what I mean. The house in Sougia can be rented and used from the beginning of May to the end of October. The house is equipped with a roof terrace, which is also the yoga place or the venue. Covered and sheltered, this place can be used all the time during the season. Furthermore there is an apartment that is available to the yoga teacher or the person who heads the retreat. The house in Kenya is available all year round and offers space for yoga as well as for any other retreat. The participants are accommodated in a villa. The villa stands on a 4000m2 plot and offers a lot of space for each individual. The possibilities on the property are diverse – apart from a magnificent swimming pool amidst lush plant and flower splendor, a meditation place, an area for the group event like yoga etc., which is located in a quiet place of the property, there are still many quiet places to stay and relax and entertain.